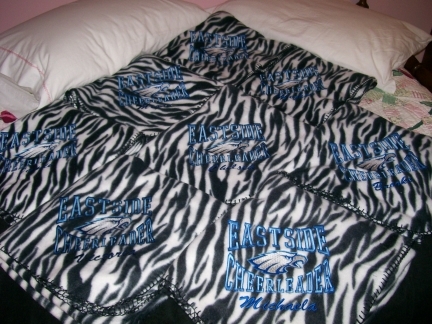 I'm pleased to show you these Eastside Cheerleader blankets I did for the 8th graders on Megan's squad. I still cannot believe she will be going to High School next year! These are lightweight fleece throws & the kids just love them! I'll be glad to work with your on a very special gift for your group. Please email me to discuss your idea & for an estimate.